Divine Fervor is an epic Willpower support card. It is part of the Core Set. In addition to the card's availability in the Core Set, one copy is included in the Band of Survivors theme deck. "Kynareth, spirit of the sky, guide us!" 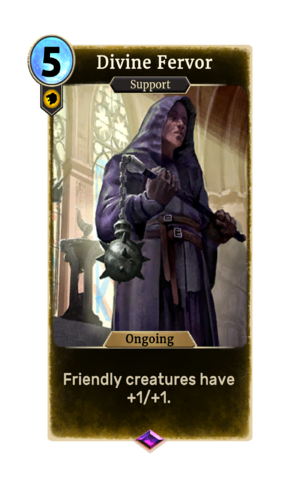 This card was previously part of the training mechanic where it could be upgraded from Divine Conviction at level 9. This card's magicka cost was increased from 4 to 5 in patch 1.59.7, because Spellsword token decks in Arena were too strong. This page was last modified on 16 February 2019, at 22:34.